The post Dealing with Food Aggression in Dogs by Marybeth Bittel appeared first on Dogster. Copying over entire articles infringes on copyright laws. You may not be aware of it, but all of these articles were assigned, contracted and paid for, so they aren’t considered public domain. However, we appreciate that you like the article and would love it if you continued sharing just the first paragraph of an article, then linking out to the rest of the piece on Dogster.com. Resource guarding is a fundamental survival instinct for most species — including humans and wolves. In the wild, after all, limited provisions need to be protected and conserved. Guarding behaviors can manifest in our domesticated dogs, too. These furry family members may insist on hovering over their toys, or growling at other pets who venture near their bedding. One of the most problematic guarding behaviors pet owners encounter is food aggression in dogs. I’ve rehabilitated several abused rescue canines over the years, and this scenario has cropped up more than once in my own household. Here are some insights and guidelines that may prove helpful when dealing with food aggression in dogs. First, What Exactly Is Food Aggression in Dogs? How Does It Start? Food aggression in dogs may start when dogs are puppies. Photography © cmannphoto | iStock / Getty Images Plus. Newborn puppies often need to compete with their littermates whenever it’s time to eat. In an abusive situation, food may be withheld for lengthy intervals. A young dog alone on the streets may need to scrounge for every morsel of sustenance. Does a similar dynamic hold true in shelter environments? As shelter program manager for A Sound Beginning, Frost has worked with well over 15,000 dogs in homes and shelters, addressing resource guarding behaviors of varying complexities. He explains that he occasionally sees “a greater likelihood of shelter dogs guarding food against other dogs — which, while not desirable, is part of normal canine behavior.” He’s also quick to add that “well-run, responsible shelters” prioritize safety, fully disclosing any behavioral issues they observe firsthand. Remember that, sometimes, food guarding in dogs doesn’t really involve any outright “aggression” at all. A young pooch may gobble up part of his morning meal, then scamper into a quiet corner to swallow it. 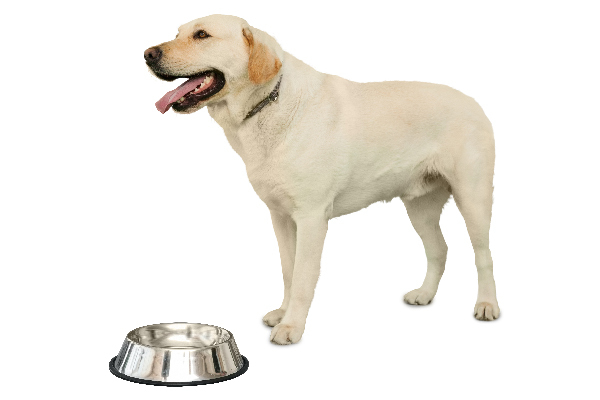 An older pet may emit a restrained whine when you walk near his bowl, then quietly resume eating. But, unfortunately, food aggression in dogs can be much more intense. Some canines who guard their food act out toward humans. These pets may chase a child away from their dog dish. They might nip at a stranger who stands too close to a treat. They may snarl at an owner who tries to remove food before the pet is finished consuming it. As Frost mentions, there are also dogs who mainly display food aggression toward other dogs. These pets don’t necessarily get feisty with humans in their midst, but unsuspecting canines can find themselves in jeopardy. Certain food-guarding pups, of course, seem suspicious of basically everyone. But Frost notes that, in some ways, that canine-specific element can be the toughest to re-shape. “We humans can tend to forget just how instinctive intra-species resource guarding can be,” he explains. Sometimes, re-introducing another animal during training can re-trigger deeply ingrained patterns of conduct. Any type of food aggression in dogs requires your attention. Photography © Wavebreakmedia | iStock / Getty Images Plus. Sometimes, at-home protective measures against food aggression in dogs may simply involve giving your canine a very wide berth during meals. If you’re in a single-pet household with few human family members, for example, you could try placing the food bowl behind a sturdy barrier. Once anything edible is in your dog’s vicinity, never attempt to manually take it away. Visitors, of course, can exacerbate the inherent risk factor. If you have guests, it’s a good idea to prohibit them from interacting with your pet while food is present. To ensure safety and prevent potential guarding of “people food” you put on the table, it’s also wise to confine your dog in another room during human mealtimes when visitors are present. Exercise tremendous caution when it comes to food aggression in dogs out in public. All food should be removed in these scenarios, especially when other humans or pets are in the area. Also keep in mind that many boarding facilities may refuse to take a dog who exhibits overt food aggression. The danger becomes too great for employees and other animal guests. If the facility does agree to board your pet, they may ask you to sign a special waiver. You’ll also need to provide explicit instructions about feeding your canine in an area completely isolated from others for the duration of each meal or snack. Households with multiple dogs require special safeguards if you notice any inclination toward intra-species guarding. According to the ASPCA, the operative term here again is “separation.” You can try pre-measuring food portions to ensure each pet is receiving enough to feel fully satisfied. Then, position the dog bowls in separate areas of the room — or on opposite sides of a wall. In extreme situations, you may need to place the bowls in entirely different parts of the house. Also remember that similar measures should extend to treat time. When dispensing treats, be certain your dogs are a suitable distance away from one another. The degree of separation largely depends upon the intensity of the behavior. As a common-sense precaution, never leave meal or snack time unsupervised if your dog guards food from pets or people. You may need to observe from a safe distance, but keep watch to ensure that nobody ventures into your pet’s space. As previously mentioned, some dogs may begin guarding food that’s not even their own. They may routinely act aggressive around scraps that accidentally fall on the floor, for instance. They might even display domineering behavior with edibles a human family member is actively trying to consume. If children or toddlers spend time in your household, the situation becomes even more precarious. Younger family members may not always understand the abundance of caution that’s required when dealing with food aggression in dogs. In these situations, specialized intervention may become unavoidable. According to Frost, punishing a dog for resource guarding “is a surefire way to exacerbate the behavior, especially when you remove the guarded item as a form of reprimand.” The risk, he explains, lies in teaching a resource-sensitive canine “that a lower-level guarding behavior wasn’t enough to keep that coveted item.” This could actually escalate the issue going forward. So, if your dog exhibits any level of consistent food aggression, resist the urge to intimidate, threaten, provoke or punish your pet. Seek professional help for food aggression in dogs if you fear that your dog may hurt other people, other animals/pets or you. Photography by Molly_Wolff_Photography | iStock / Getty Images Plus. Before attempting any type of intervention for food aggression in dogs, honestly assess the likelihood that your dog may actually try to hurt you. If this is even a possibility, it’s best to entrust reconditioning to a skilled professional. Frost strongly recommends finding a trainer who has direct experience working with food aggression in dogs. The individual “should also be well-versed in positive reinforcement that uses a reward-based system without corrections,” he says. Careful research is key. Frost suggests double-checking credentials, and making sure the trainer has remained current with the latest techniques. “I would also ask who they refer out to if they feel the behavior is beyond them,” notes Frost. He adds that “qualified trainers should readily feel comfortable referring out to veterinary behaviorists.” The ASPCA points out that you can research board-certified veterinary behaviorists yourself at dacvb.org. According to the ASPCA, a strategic combination of desensitization and counterconditioning exercises is often the most effective approach to help minimize or eliminate food aggression in dogs. The organization recommends conducting these exercises in very careful stages. Once your dog appears absolutely relaxed, with no signs of aggression, you can proceed to a subsequent training stage. To determine what “relaxed” looks like for your particular pet, the ASPCA suggests observing him in an unperturbed state — lounging on the carpet, taking a casual outdoor stroll, etc. Note the position of his ears and tail, and observe his natural breathing patterns. You can see the complete suggested training sequence on the ASPCA website. As the organization explains, you gradually want to teach your dog that approaching him during mealtimes is a very positive thing. 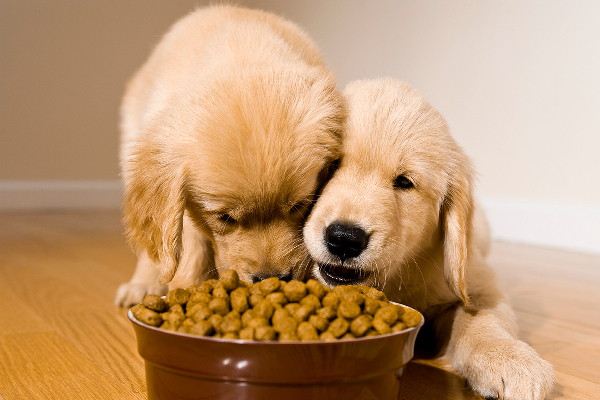 You do this by demonstrating that you may offer something tastier than the food already in your canine’s bowl. The ASPCA recommends securing your pet to an immovable object or wall if you’re uncertain about his potential reaction. That way, you have time to step back if he proceeds toward you in a worrisome way. Whole Dog Journal notes that a two-handed “trading up” technique can sometimes help to re-shape food aggression in dogs. Basically, you would start with a lower-value item your pooch likes, such as a toy. Once he’s contentedly in possession of that object, offer him a very high-value treat like bacon, salmon, etc. with your right hand. The minute your dog relinquishes the given object to accept this treat — i.e., the very moment his mouth is otherwise occupied — pick up the object with your left hand. Then immediately praise profusely with a consistent verbal prompt like “Yes!” Finally, once your canine is done enjoying his special treat, give the original object back. According to Whole Dog Journal, once you’re confident that your canine will drop the object as you present a yummy tidbit, you should start giving a verbal “Trade!” cue right before you offer the treat. Experts like Frost recommend repeating this exercise multiple times per training session, consistently varying the interval between giving this “trade” cue and presenting the goody. You want your pet to begin dropping the object on cue, even before that tasty treat comes into view. Once your pup is dropping this lower-value object on cue every single time, Whole Dog Journal suggests working up to higher-value items very gradually. So, for example, you might proceed to a beef-basted bone or pig’s ear at some point. Choose items based upon your canine’s individual preference. Your eventual goal, of course, would be working up to the food your dog prizes so highly. If at any time you notice signs of marked tension or outright aggression, discontinue at-home training exercises without delay. Consult a skilled professional for further assistance. Again, stay in tune with your dog’s body language to look for any signs of stress. Can Food Guarding in Dogs Be Prevented Before It Starts? If your dog is consistently relaxed around food, start hand-feeding a few meals a single bite at a time. Sit with your pet, gently stroke his ears and speak in soothing tones. If hand feeding doesn’t prompt any signs of tension, continue sitting with your dog but start placing his food bowl on your thigh. Permit him to eat from this dish as you lightly pet him and offer verbal praise. If your dog tolerates the above exercises, begin placing his bowl directly on the floor. Then, as he’s eating, intermittently drop a tiny morsel of something extra-scrumptious into his food. It could be a small nibble of steak, or a bit of cheese. Continue doing this randomly for several months. Frost reminds owners that this “trading up” approach is critical. What you offer should always be more desirable than what your dog already has. In conclusion, it’s not impossible to live with food aggression in dogs. However, if this challenging behavior becomes particularly troublesome, it’s best to consider targeted reconditioning exercises. Simply remember that tendencies toward food aggression in dogs may benefit most from working with a skilled professional trainer. That’s critical food for thought when it comes to keeping everyone in the family safe. 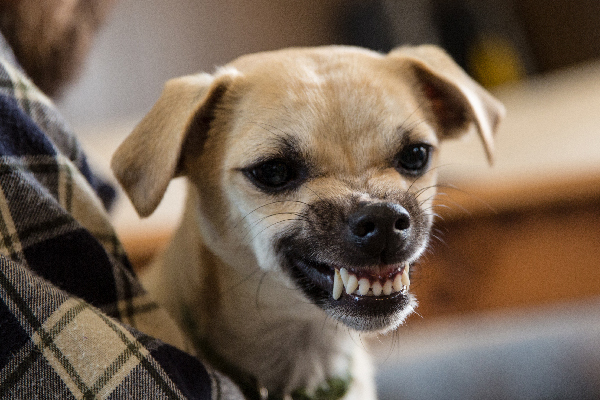 Tell us: Have you ever dealt with food aggression in dogs? What best helped your dog? Thumbnail: Photography © GlobalP | iStock / Getty Images Plus.